I would formally like to announce it is with great sadness Country Care will cease to provide services as of June 30 2016. This decision has not been made lightly and is due to personal health issues. I would personally like to thank Clients, Care Workers and Professional Health Workers who have supported Country Care over the past 24 years. Quite simply, an NDIS will make it possible for people with significant and permanent disability in the first stage locations to get the necessary care ... read more. 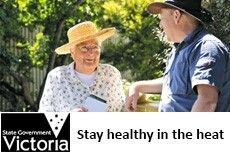 The VACC is offering Driveway Assistance at member locations across Victoria. The service is available to people who are not able to fill their car ... read more. The Funded Agency Channel (FAC) is the Department of Human Services primary online business and communication tool with agencies it funds. Learn more about FAC. ... read more. As of 1 July 2007 the Victorian Government will introduce a mandatory background check on all people working with children. This will include Volunteers and ... read more. Are you looking for services? Click here for Human Services Directory. Please be aware Heat Stress should seriously be considered from December through to the end of March The temperature can reach into 30's to low 40c for this period. please take appropriate precautions. What is Attendant Care ?? They may also assist you with attending community activities and social or recreational events, with transport and other support as required. People with a disability have the same rights as other people in their community. They have the right to freedom, respect, equality and dignity. They have the right to fulfil their potential, to exercise control over their own lives, and to live free from abuse or neglect. People with a disability are some of the most vulnerable people in our society, therefore specific laws are in place that protect the rights of people with a disability.